Stylish SE NEW - All SE models have machined aluminum wheels, one-piece front brush guard, rear accessory bumper and available in Silver Metallic. Handlebars NEW - A redesigned handlebar with improved bend for increased ergonomic comfort in all riding situations. Tires - The newly developed Goodyear Rawhide RS is standard on all Arctic Cat ATVs (25x8-12 front, 25x10-12 rear) for improved traction, durability and ride handling. Engine Side Covers - Easily removable engine covers diffuse sound while creating a clean appearance to the engine compartment. Automatic Transmission - With Hi/Lo-Range allows responsive acceleration and engine braking. Transmission also features start-in-gear to get you going faster. 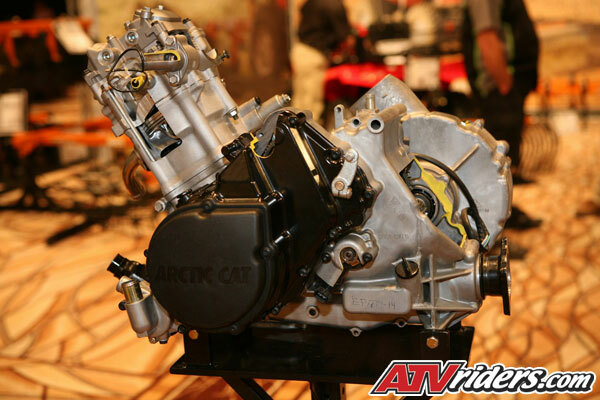 GNCC and WPSA Race Proven Winner - Just ask Factory Arctic Cat racers how powerful the new 700 H1 engine is. They’ll gladly tell you how they spank the competition’s comparable output V-twin engines every weekend. EFI - Electronic Fuel Injection aids in perfect starting no matter what altitude or temperature changes. Suzuki-Built - Suzuki-built 700EFI is a true stand out motor built to tackle every work chore and obstacle thrown at it. Performance Minded Ergonomics - The seat on the 2008 Arctic Cat 700 H1 EFI SE has been redesigned and lowered approximately one inch to reduce the riders center of gravity along with giving an improved sense of sitting “In” the machine instead of “On” it.